This is a creative and flavourful, innovative twist on the classic alcoholic ginger beer. 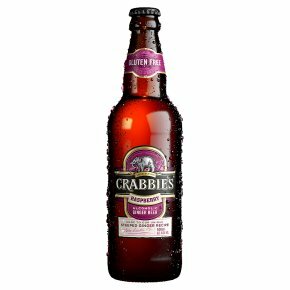 The experts at Crabbie's have combined natural raspberries and ginger to create this refreshing fruity drink. Try serving on its own with ice, or use it as a base for some exciting cocktails. Made to our unique steeped ginger recipe. Gluten free.Discover the luscious, distinguished taste of Scottish Raspberries, a burst of refreshment with a hint of ginger. Today, Crabbie's Alcoholic Ginger Beer comes in a wide variety of flavours but still retains the same pioneering and adventurous spirit of its founder. It's that spirit that makes Crabbie's drinks genuinely surprising and unique. We call it Refreshingly Adventurous.